Will I Get a Penalty? Some of you wondering if you are going to get hit with a penalty come 2014, the above picture is the best want to have a “quick check” on if you will or not. For more details, keep reading…. For the purposes of this provision fulltime is defined as an average of 30 or more hours per week. Solely for the purposes of determining group size, the employer must calculate the number of FTEs or fulltime equivalent employees by including the employees working less than 30 hours into the equation. For months beginning after December 31, 2013 an employer with an average of at least 50 FTE (full time equivalent employees) on business days in the preceding calendar year who fails to offer coverage to fulltime employees and their dependents (nothing is said about employer contribution) will pay an assessment of $168/month or $2,000/year for each fulltime employee who is able to obtain a premium tax credit or subsidy through an exchange (minus the first 30 employees). Example: 60 fulltime employees- 30= 30 full time x $2,000 = $60,000 assessment. Employers who do offer coverage but that is not minimally essential or unaffordable (meaning the employee contribution exceeds 9.5% of W-2 income for the lowest tier single premium) will pay $3k per FT employee who is able to obtain a premium tax credit or subsidy through the exchange. The assessment is limited to a maximum of $2k per FT employee minus the first 30. Note subsidies are only available through a state or federally run exchange and are only available to individuals who are not eligible for Medicaid and who earn less than 400% of the FPL. The proposed regulations provide some transition relief for the determination of large employer status in 2014 that is aimed primarily at employers near the 50 full-time equivalent employee threshold. The transition relief allows employers to determine whether they are large employers based on a period of six consecutive calendar months as chosen by the employer in the 2013 calendar year, rather than based on the entire 2013 calendar year. Relief was afforded to large employers who maintain a non-calendar year plan. 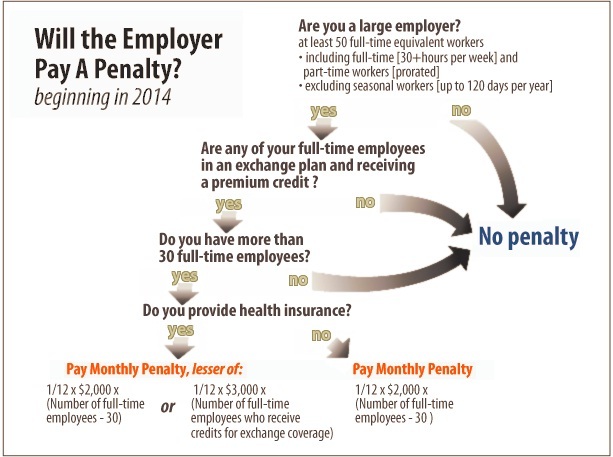 If the employee is offered coverage that meets the law’s affordability and minimum value standards no later than the first day of the 2014 plan year, then no IRC §4980H penalty will be assessed with respect to that employee for the period prior to the first day of the 2014 plan year. Note: Affiliated company rules changed with the proposed IRS rules of 12-28-2012. Facts: Corporation A owns 100% of Corporation B. Corporation A employs 40 full-time employees in each calendar month of 2015. Corporation B employs 35 full-time employees in each calendar month of 2015. For 2015, the IRC §4980H(a) excise tax for a calendar month is $2,000 divided by 12. Corporation A does not sponsor an employer-sponsored plan for any calendar month of 2015, and receives a certification that at least one of its full-time employees has acquired health care coverage on an Exchange with the benefit of a premium tax credit. Corporation B sponsors an eligible employer-sponsored plan under which all full-time employees are eligible for minimum essential coverage that is affordable and meets the minimum value standard. BIG change here. Standards will be applied separately to each entity that is a member of the controlled group comprising the employer (referred to in the rule as a “large employer member”) in determining the liability for and assessment of any tax penalties under IRC §4980H. (In this document, reference to “large employer member” means a member of a controlled group and also an employer that is a single entity and not part of a controlled group of corporations. If one entity of a controlled group is assessed, only the FT employees of the ONE entity is assessed, not the entire group. Penalties and deduction of the first 30 employees therefore will be allocated to each separate entity based on its share of the total. The proposed regulations define “dependents” for purposes of IRC §4980H as an employee’s child under age 26. Employers will not face tax penalties for not offering coverage to spouses, who will be able to seek a federal premium tax credit to purchase health insurance in an Exchange if other minimum essential coverage is not available. This definition of dependents does not apply for purposes of any other section of the Code. Note: FTE means fulltime equivalents, NOT fulltime employees.